No. Not far from where the Brits started winter holidays in the 19thC. In the Italian area of Switzerland. The train passed through Cavaglia which I Googled. Hope that you had a great time. Rail Tour perhaps. Your are right. 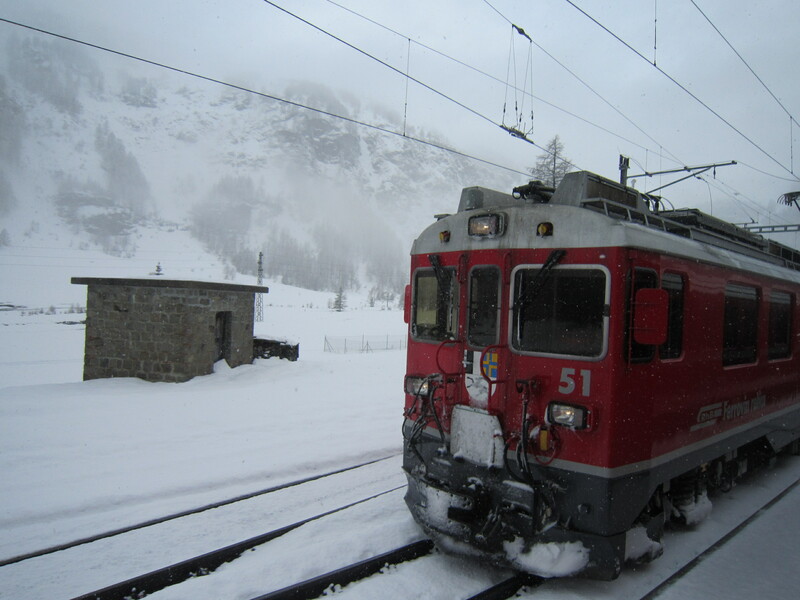 The train is the Bernina Express and we travelled on it from Tirano in Italy to St Moritz in Switzerland. The line has World Heritage status and on this stretch climbs up to about 2300m from 440m in Tirano before descending to 1820m at St Moritz. The line is narrow gauge but not rack and pinion. The views are are reputedly spectacular. We had to make do with heavy snow as you can see from the pictures!